This Northern Lights Photography settings guide, in 7 easy steps, is aimed at beginners. You can use any camera with an option for Manual settings. Following these steps, most modern cameras will produce beautiful digital photos for on-screen purposes. Set your lens to Manual. Turn off Image Stabilization (typically the button next to ‘manual’ on your lens). Turn your Flash setting to OFF! Why must I use the Manual settings? Automatic settings are great in daylight, when the camera can sense and measure it’s surrounding. But cameras don’t see in the dark, and thus the Automatic setting is useless in Northern Lights conditions. If you leave your lens set to Automatic, it will continuously zoom in and out in a failed attempt to find focus in the dark. And because of the dark it will want to use the flash; to read the area. Your flash, however, is a harsh light pollutant and will wash out the Northern Lights and temporarily blind everyone around you. Make sure your flash is set to OFF. This is what controls the light sensitivity of your ‘film’. Some of you may remember a pre-digital era when you had to choose a different ISO film for different occasions. ISO 100 or lower for sunny days and ISO 200-400 for cloudy days. Digitally, now it’s a turn of a button. The ISO button. The higher the ISO, the less light you need to “develop” a picture. But beware; with higher ISO comes lower quality. Most modern cameras do well with ISO 1600 (or even more) without compromising quality. Older cameras may produce grainy photos on ISO above 400/800. It’s helpful to gain a deeper understanding of ISO and Photography Talk have the perfect article for it. The aperture, or f-stop (f-2.8, f-4, f-5,6 etc) on your camera tells you how widely your lens is open = the size of the opening letting light through the lens. This you can adjust by setting the f-stop. Confusingly, the lower the f-number, the bigger the opening. For Northern Lights photography we want the biggest opening (the lowest f-number) possible on our camera. Because: the more light your lens can take in = the lower shutter speed you can use = the quicker you can capture your shot = the more detail you can get in your Northern Lights image (because the lights are constantly moving). Not in the dark. Get to know your manual focus options. If you have the infinity option (∞), great. But test it, it may not be exact. Ideally, find your focus during daylight hours, and either memorise it or make a mark on your lens rim (use tape, white marker, Tippex etc.). And always zoom out completely, the Northern Lights occupy a large space in the sky, and we want to capture as much of it as we can. Why can’t I just push the shutter button? Earlier, we talked about the problems of being a living, breathing human body. Every time you touch your camera you will shake it, causing a possible blur in your photo. This is also applicable when you push the shutter-release button. Remote control is best. 2 sec. self-timer is also good. Some cameras can use apps. Try out all these Northern Lights Photography settings before going out on your hunt. Get to know your camera. Once you are out, set everything up and do some test shots. Adjust the settings as needed. If your image is too bright, lower your shutter speed or ISO. If your image is too dark, up your shutter speed or ISO. Normally not needed for a 3-4 hours night out Northern Lights hunting. But, if your camera is highly technical or if you will be using an app, you may be needing 1-2 extra batteries. 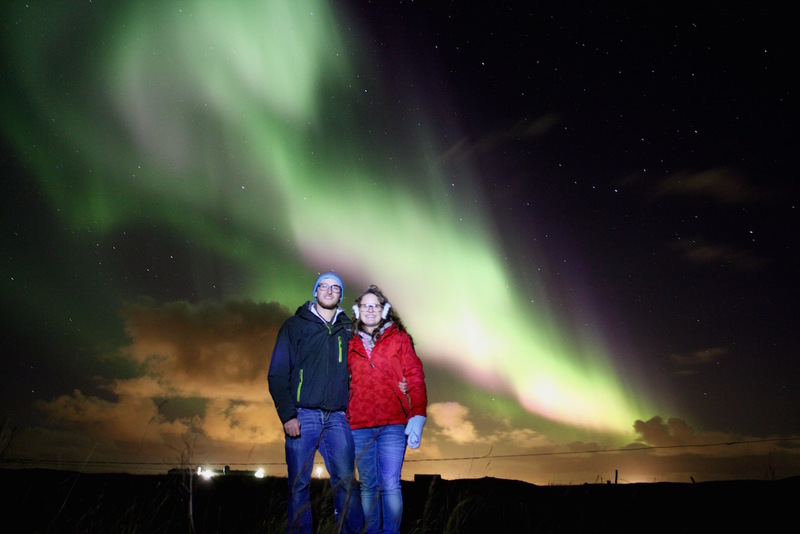 Want a picture of yourself under the Northern Lights? Anywhere during the exposure time your friend flashes you with a quick light. Do some test shots to get used to the method and find the best lighting. Et voila! You have a photo of yourself under the Northern Lights! Advanced Northern Lights Photography Settings?